Cheshire West and Chester Council is mourning the loss of a respected, long-serving Councillor who has sadly passed away. Councillor Lynn Clare MBE represented Ellesmere Port Town since 2011 and was first elected to Cheshire West and Chester Council in May 2008. Councillor Clare served on a number of committees including Chairman of the Licensing Committee and held many important roles including as Mayor of Ellesmere Port in 2015/16. In addition, Councillor Clare was awarded an MBE in 2004 after establishing the charity Parents Against Drug Abuse (PADA) for which she worked for 15 years. Cheshire West and Chester Council’s Deputy Chief Executive for Places, Charlie Seward, paid tribute to Councillor Clare: “Everyone at the Council is saddened by the tragic news of Councillor Clare’s death and we are all thinking of her and her family. “Councillor Clare was dedicated to serving her local community and worked tirelessly to make a positive difference to the lives of the people she was elected to represent. “Being awarded an MBE for the work she did to tackle the problem of drug abuse was recognition for the passion she had for helping others. Councillor Samantha Dixon, Leader of the Council, expressed her sadness at the passing of Councillor Clare: “Lynn was a marvellous woman, always positive; she laughed in the face of adversity and turned every negative into a success. 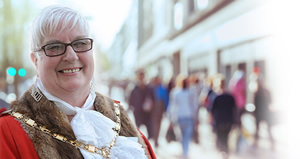 “I was privileged to put forward Lynn as Mayor of Ellesmere Port in 2015 and I cannot think of anyone who deserved the honour more, she was highly regarded, warmly respected, well-loved and passionate about Ellesmere Port. Councillor Lynn Riley, Leader of the Opposition also paid tribute to Councillor Clare: “Lynn will be sadly missed by many including her colleagues in the Conservative team, many of whom have known her since the creation of the Council in 2008.